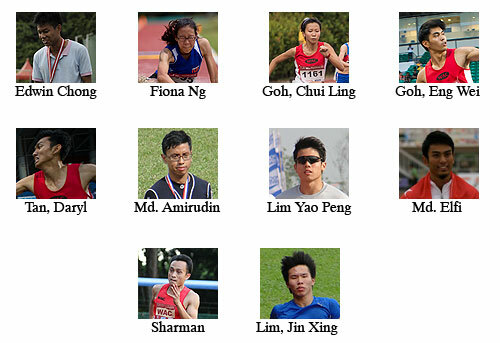 Two local SAA affiliated teams, National University of Singapore and Wings Athletic Club travelled up to Ipoh last week to compete at the 2012 Perak All-Comers . The team from NUS comprising of 11 athletes managed to snag a tidy haul of 9 medals, while 2 athletes from Wings added another 2 medals to the tally. In the century sprint event, Md. Elfi Mustapa managed a season-best of 10.50 seconds, not only grabbing gold but also equaling the meet record timing. He is now ranked number one male runner in Singapore currently in the 100 meters event, behind joint ranked duo of Gary Yeo and Calvin Kang who are tied at 10.57 seconds. The competition also saw personal best from NUS Goh Eng Wei in the 400 meters men event, clocking 49.83 seconds during his heat, and Wings Lim Yao Peng improved on his PB too with a 10.86 seconds effort in the 100 meters men event.